Has Turkey Lost Its Luster for Luxury Brands? By ELIZABETH PATONDEC (NYT) Stellar growth in once white-hot emerging markets appears to have gone out of fashion for much of the luxury sector. Sales in China have slowed in line with its cooling economy, while stagnating demand in Russia and Brazil continues to take its toll. Now in Turkey — a country that physically and culturally straddles East and West with one of the industry’s fastest-growing markets and a young and booming middle class — luxury heavyweights who invested there recently may be taking stock. In the last four years, Prada, Hermès, Louis Vuitton, Gucci, Chanel, Christian Louboutin, Tod’s, Ralph Lauren and Armani all have opened at least two glittering mono-brand stores in Istanbul, while Ermenegildo Zegna and Burberry now have three stores each there. Tory Burch, the American accessible-luxury queen, opened her second store late last year. Many of the big names are found in the two Western-style shopping centers that have opened: Akasya Mall and Zorlu Center. And in August, Soho House, the London-based private members club for creative people, opened a five-floor outpost in the former American Consulate, a 19th-century palazzo that has been restored to include baths, a Cowshed-brand spa and a rooftop pool with breathtaking views over the Bosporus. But amid an economic slowdown after years of steady growth — along with concerns about the chaos in neighboring Syria and the civil unrest before the national election last month — the race by powerhouse brands to expand in Turkey has stalled. Following the terrorist attacks in Paris and two suicide bombs that killed 99 people in Ankara, Turkey’s capital city, in October, the country appears to be volatile juncture. She added that, in a year of volatile foreign exchange rates, the Turkish lira has proved to be one of the world’s weakest currencies. Bain has forecast that the global market for personal luxury goods is heading for its weakest year since 2009, with sales this year expected to rise to $280 billion, as little as 1 percent growth from 2014 levels. But despite some investor concerns and its recent political and economic uncertainties, Turkey continues to be a core strategic market, with many producers bullish about its prospects. Although the country accounts for just 1 percent of global luxury spending annually, luxury sales in Turkey jumped 37 percent from 2008 to 2012, according to the research group Euromonitor. And in 2013, they surged 12 percent from the previous year, to an estimated $3 billion. Spending on luxury goods in Turkey rose 52 percent from 2009 to 2014. Over the next five years, the size of the luxury goods market is expected to grow 41 percent. By 2018, Euromonitor said, the market is expected to nearly double, reaching $5.4 billion. The primary financial firepower driving this growth is Turkey’s flourishing middle class. McKinsey, a consulting firm, estimates that between 2013 and 2017, Turkey’s total personal disposable income will rise to $906 billion from $652 billion, as a generation of millennials hit their spending stride. In particular, McKinsey pointed to more higher-paid female professionals in the work force triggering a rapid uptick in household purchasing power. “Istanbul is a trend-setting city, full of young, educated, technologically savvy spenders, but it has also become a destination for international travelers,” said Demet Sabanci of the Demsa Group, which has brought labels including Tom Ford, Alexander McQueen, Salvatore Ferragamo, Lanvin, Michael Kors and Harvey Nichols to Turkey. 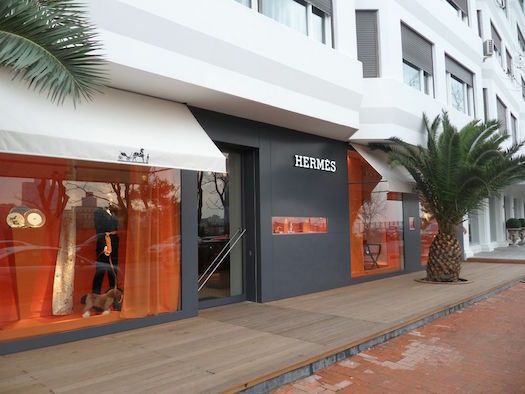 Western brands arriving on the Turkish retail scene have often enlisted in the services of powerful local partners or joint-venture operators like the Demsa Group to help navigate the real estate market and to shape stores to local tastes. However, as taxes can push the cost of luxury goods in Turkey to as much as 20 percent higher than levels in Milan or Paris, many of Turkey’s high net worth individuals — those earning more than $1 million a year — increasingly do much of their shopping abroad. But, as a crop of recently unveiled four- and five-star hotels in Istanbul indicates, foreign brands’ foray into Turkey has wealthy tourists as well as local buyers in mind. And the city of 14 million has become a popular destination, logging 10 million visitors in 2014, particularly from Europe and the United States. Boutiques in coastal resorts, once popular stomping grounds for Russian bourgeoisie, have been hit hard by the conspicuous absence of those patrons since 2014, when the European Union and the United States imposed sanctions on Russia for its military intervention in Ukraine. But many Istanbul retailers say that foot traffic from Central Asia and the Persian Gulf has never been stronger. Heavily influenced by Turkish soap operas and radio stations, those visitors from nearby regions now drive as much as 20 percent of the total retail spending in the city, according to the online luxury business platform CPP Luxury. Domestic luxury brands as well as outsiders are eager to capitalize on the flood of visitors and a more affluent Turkish population. Many that once looked to the West for creative inspiration are finding that there is growing appetite for products showcasing Turkish national identity and design heritage. And local designers say craftsmanship incorporating traditional materials, colors and styles has produced an explosion of demand both from foreign shoppers and those closer to home. Ms. Ege, along with her sister Ece, directs the Turkish couture house Dice Kayek. They ran a global ready-to-wear line with that name for more than 20 years. A one-off collection they created — marrying contemporary design with an homage to Istanbul architecture — received extensive critical acclaim and won a prize of 25,000 pounds, or $39,000 at today’s exchange rate, in 2013 from the Victoria and Albert Museum in London.